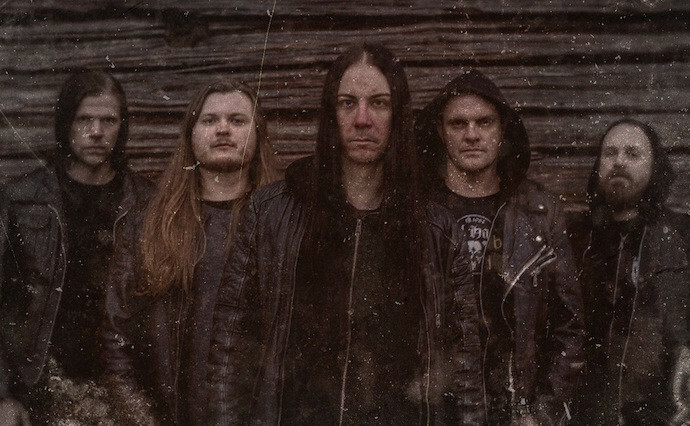 In their 25th year October Tide are releasing a new album, which founding guitarist Fredrik Norrman describes as “a bit more aggressive, a bit more death metal, and with an overall colder feeling than previous records”. His brother, guitarist Mattias, is still in harness, as is vocalist Alexander Högbom, but since the band’s last album they’ve added a new bassist (Johan Jönsegård) and a new drummer (Jonas Sköld), both of whom are also members of Letters From the Colony (who seem to have a lot of Meshuggah in their DNA, at least based on this live video from last summer). 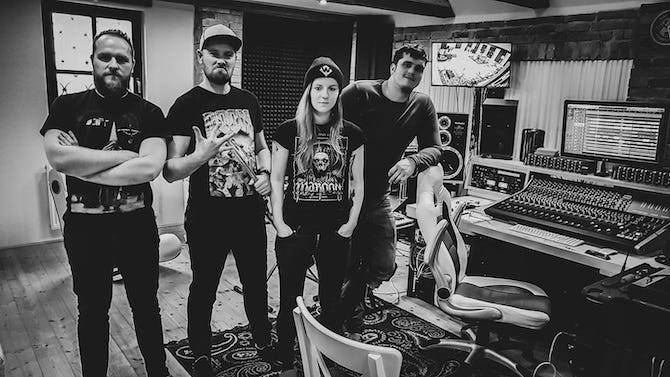 The new rhythm section seem pretty adept at polyrhythmic interplay based on that video, but on the new October Tide track “I, The Polluter“, they prove themselves capable of plowing ahead in more straight-forward, neck-cracking fashion. The song as a whole is a bruiser, and while there are definitely gloomy, groaning, and haunting currents in the music, particularly in the song’s back half, it’s also a tension-building pulse-pounder, and Alexander Högbom‘s vocals are absolutely deranged. As my comrade DGR wrote after hearing it, it’s “an ugly, heavy song and surprisingly fast”. The name of the new album is In Splendor Below. It will be released on May 17th by Agonia Records. The “AD” suffix is your clue to the tale of yet another band that broke apart and now exists in warring camps who each claim the original name. In this instance Nocturnus carved their name in the death metal history books with the 1990 album The Key, after which certain members of the band trademarked the name and then fired the band’s founder Mike Browning (who also co-founded Morbid Angel). 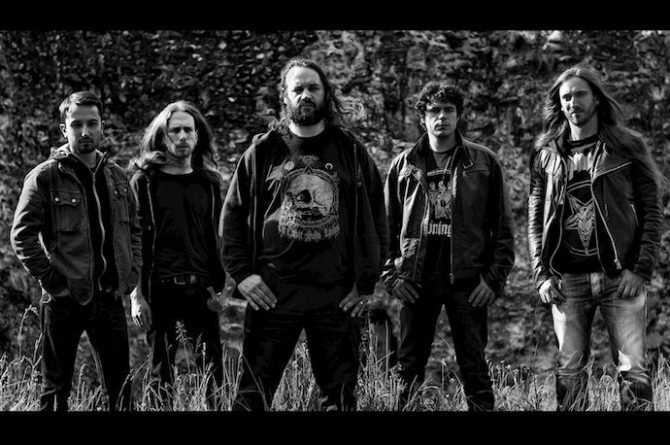 Browning carried on with other members of Nocturnus under the name After Death, releasing a handful of demos between 2002 and 2009, and a split with Unaussprechlichen Kulten in 2012. 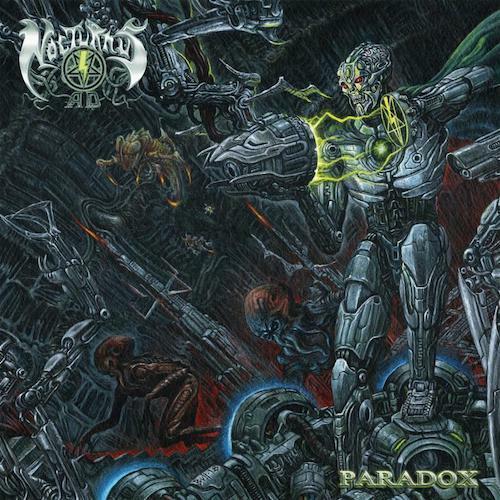 Now the same line-up of After Death is releasing their first album, and in doing so have resurrected the Nocturnus name, with the “AD” suffix. Entitled Paradox, it will be released on May 24th by Profound Lore Records. With The Key, Nocturnus embraced a sci-fi narrative concept, and Paradox continues the tale, albeit almost 30 years later. “Precession Of The Equinoxes“, the first public excerpt from the album, is about the shifting of Earth’s magnetic poles, a process that happens in cycles and now appears to be happening again. The song seems to begin in media res — no intro, no build-up, just immediately in motion, and the motion is wild and whirling. The music’s battering rhythms and Browning‘s scorching howls give the music a vicious energy, while the keyboard motifs and utterly crazed fretwork create a feeling of delirious abandon. Frequent tempo changes and bursts of instrumental pyrotechnics will keep you bolt-upright and also off-balance, and probably wide-eyed and slack-jawed by the end. Credit to Timbul Cahyono (Pyrexia, Avulsed, Terrorizer) for the cover art. I really can’t get enough of this next song. It hit so many sweet spots when I first heard it. On about the sixth listen yesterday, it was still hitting them. 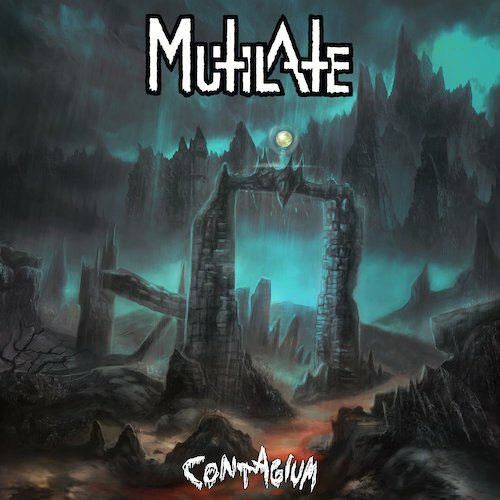 “Vile and Disgusting” is the creation of the NY death metal band Mutilate, and comes from their second album, Contagium, which will be released by Iron Bonehead on June 7th. The label’s publicist describes the album as a “crude ‘n’ rude” throwback to the waning years of the ’80s, when Death Strike, Hellhammer, Nunslaughter, and Goatlord were making their names, and references are also made to later bands such as Benediction, Acheron, Usurper, and Sathanas. The toxic, rapidly writhing tone of the guitars and the pummeling punch of the bass and drums at the beginning provide a potent skull softener for the pulsing riff and the jet-fast snare rhythm that really kick the song into high gear. The monstrous vocals bark and roar the lyrics in a way that adds to the song’s physical compulsiveness, and the weird, warbling guitar leads lend the music an eerie atmosphere, to go along with all the rampant firebrand chaos. It’s a thoroughly electrifying experience. With this next song I’m taking a hard turn off the road I was on. The masked violinist (Yulia Ermakova), whose performance opens this next song and lyric video, is your first clue. I didn’t know what to expect, having missed this Czech band’s previous album, Consuming the Tempest (2015). According to Rennie (starkweather), who recommended this video, the vocals on this new single are different (“creepy and quasi-melodic”) from what they were before. “Turning Possibly Into Never” is itself a creepy, haunting experience, building an angst-ridden tension at first and then pushing things over the brink into despair. 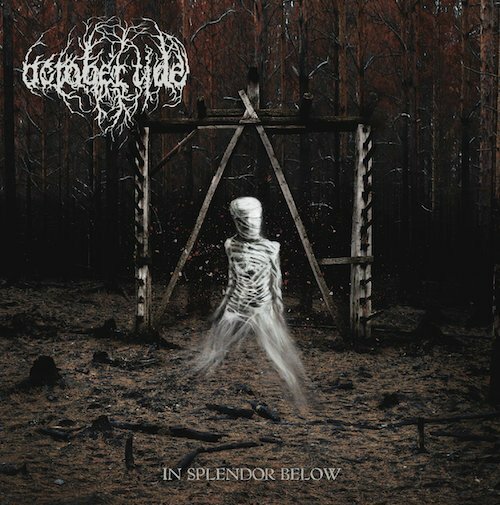 I really enjoyed the clean vocals, which seem perfect for the music’s unsettling moods. They are indeed quasi-melodic, and often quasi-unhinged — and completely melodic and heart-aching in the middle of the track. The harsh vocals are completely unhinged. And while the music is often unnerving, it’s also powerfully seductive, and beautifully miserable. There’s some heavy, lumbering doom in the mix too. I found myself enthralled by all the twists and turns. The lyric video was made by Dahlien Design. Ataraxie‘s fourth album, Résignés, delivers more than 83 minutes of merciless doom/death spread across only four tracks. In February we premiered one of those (“People Swarming, Evil Ruling”) before the album’s release on March 8th by XenoKorp, Deadlight, and Weird Truth. It was a 21-minute behemoth. A few days ago the band released a video (directed by Louise Brunnodotir) for another one of the album’s giant tracks, the 19-minute “Coronation of the Leeches“. For reasons I don’t understand, the video (at least as I write this) seems to be configured so that you have to go to YouTube to see it; I can’t embed it. But I do encourage you to go HERE to watch as you listen, because the video does a good job matching up imagery with the changing music. And that music is often heart-breakingly beautiful, in both its softer and its heavier, funeral-doom-paced movements. The music is also explosively powerful and frighteningly intense in its channeling of mental and emotional catastrophe. There aren’t many bands as adept as Ataraxie in making you lose track of time, and it’s an especially impressive talent given that they spend so many of these long minutes immersing you in pain. They give no quarter, and their unsparing devotion to hopelessness and audio nihilism is worthy of respect. 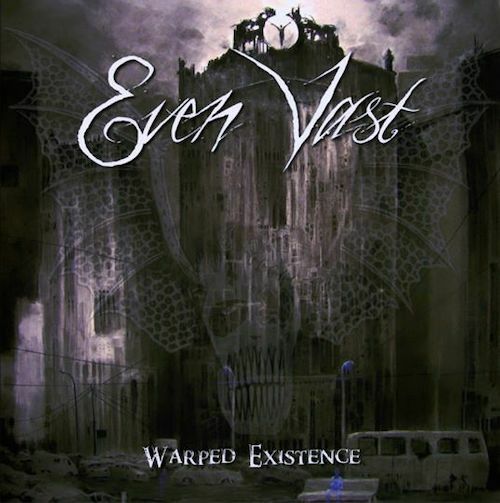 It appears that the Italian band Even Vast came into existence in 1998. Four albums have followed since then, the most recent of which is Warped Existence, which will hit the streets via the Goatmancer label on March 29th. I can’t swear that I’ve never previously listened to the band’s music, but I’m certain we’ve never written about them before. So that changes here, based on the strength of this song from the new album, “How Long“. The song has a massively heavy, gut-rumbling low end, and the thick, abrasive riffs are massively head-moving. The yowling and moaning guitar melodies give this mid-paced, stripped-down, hard-rocking song an undeniably bleak feeling, but the fiery vocals — which are usually grim and gritty but seamlessly segue into wails — sound defiant. We receive quite a lot of e-mails every week from bands interested in having us listen to their music, and unfortunately there’s not enough time to do that with a 100% success rate. 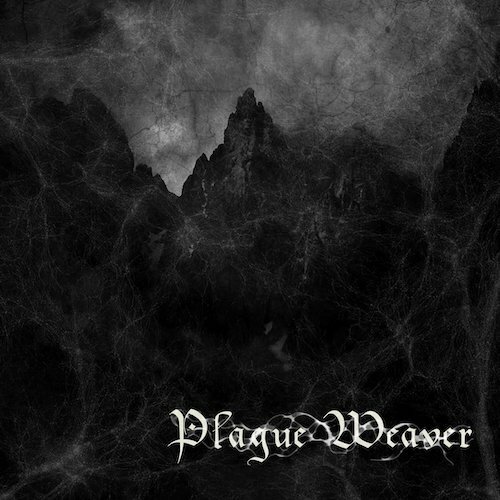 It happened that when I saw Plague Weaver‘s e-mail yesterday, I had time enough, and was quite impressed by their self-titled debut EP, which hit Bandcamp on March 17th. This seems to be a two-man formation, and they live in Mississauga, Ontario. I probably would have listened to the EP based on the name of the town alone. I decided to end this round-up with their EP in part as a segue into the usual Sunday SHADES OF BLACK column, which will arrive later today as soon as I can finish writing it. “Condemned To Worship” and “YHWH” are the two songs on the EP. The haunting piano introduction of the first song is alluring, like a wraith beckoning with pale hands, and the guitar picks up that melody without missing a beat and carries it forward. The melody has a decidedly doom-y and occult resonance, with an almost Arabian exoticism in its cobra-like swaying. The flickering lead that eventually surfaces channels misery even more intensely, but the vocals are the most intense aspect of the music, the sounds of men who have been driven mad by pain and fury. “YHWH” shares many of the same qualities revealed in the opening track, but is more immediately intense. Like the first song, it manages to be both unsettling and mesmerizing. Together, they make for a very promising advent for this Canadian duo. BTW: the video is perfectly embedded. It was sending you to YouTube before it premiered, but it’s now perfectly fitting in there. Thanks! Change of pace for October Tide, it seems; previous records were really good, looking forward to the release.